There was a snow storm in Michigan on November 22nd, but it didn’t stop these TeamSk8 and One Skate Ahead kids from getting up early to brave the storm and skate in a City League meet at Rollerama in Brighton, Michigan… of course there was a lot of help from their parents : ) The skaters at this meet ranged in age from 3 to 12 years old, and they skated solo dance, freestyle singles and/or pairs. The Michigan USA Roller Sports organization holds several City League Meets during each competitive season to provide opportunities for new skaters and recreational class skaters to learn to perform in front of judges and spectators in a newbie friendly environment and with simplified requirements. 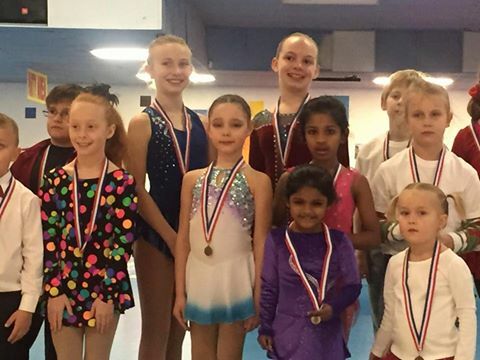 Many of these skaters evolve into champions at Local, Regional and even National level events.